Swarnalatha J is the Founder & Managing Trustee of Swarga Foundation. She’s affected with Primary Progressive Multiple Sclerosis since 2009. She holds a Diploma in Computer Science and is a post graduate in Hindi Literature. She is multi-talented and has won many awards for her work as a disability rights activist, notedly the ‘Bharat Prerna’ Award, and ‘Thanga Tharagai’ awards in 2018. She is also 1st Runner up at the Mrs. India Beauty Pageant, South held at Goa in May 2018. 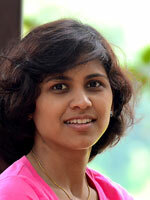 Swarnalatha is a Tedx Speaker, motivational speaker, singer, writer and photographer. She is a counsellor, works on fundraising, awareness campaigns and public relations at Swarga Foundation.